I have been remaining purposefully free of narrative for several weeks now, because of this whole cancer crisis we're going through, but once the terrain came into focus, I did find I have something to say about it. So I wrote this piece to save my own life first, much as they instruct you to do on the plane, —put the oxygen mask on yourself first before assisting others. Catherine thinks this is a sad story especially because we're living it, so feel free to pass on it. For me it feels like trying to write about anything else, at this time, would be akin to attempting to give a lecture in front of a burning building. When cancer is happening to someone you love, you escape the physical insult of it, but it will unmask you, for such times are seen as a test of character. And so this is the story of who we were on our way to arriving at this point and what parts of us turned out to be relevant to the crisis. As Catherine lay sleeping beside me, at the end of the second day of chemo, I sat up in bed watching her and noted her paleness. She was uncannily white as if her blood had turned transparent. I thought of the drugs that had been poured into her body and were now having their way with her cells, both the good ones that kept her alive and the bad cancerous ones. Then I stopped my mind for fear that those physical side effects, we now knew about, would jump into my body, into my psyche like dreams sometimes do. I had experienced that once, in my youth, with a lover whose nightmare had appeared in my head and I woke up waving my hand across space to push the vision away, to dispel the harmful intruder she was dreaming. I turned away from Catherine's sleeping form, satisfied that she could sleep so soundly. Then I lay down facing away from her and asked my spirit family to wrap me in a protective shield. Thus I drew a line between my experience and Catherine's and felt safe. When I first heard that the biopsy, of the 2 centimeter lump in her breast, had come back positive, I was immediately filled with dread at what had befallen us, at the pathos and potential drama of it. But because this was such a right of passage for so many women now and it had been caught so early, we soon regained our equilibrium and embraced the prospect of surgery and a quick recovery. But then a few days later, the pathology report revealed that the cancer was a little more unique and more aggressive. That it had a higher chance of recurrence and of appearing elsewhere in the body. Dread was now replaced by shock. I suspended my emotions waiting for more information while Catherine planned for an untimely demise. The surgeon who had given this news was a large woman with blond hair falling freely to her waist. She reminded me of a Viking. And she waded into this with a passion befitting a warrior, tracking down an oncologist at a conference she was attending, because she knew he was doing clinical trials at Stanford for just the drug that was designed to do battle with the triple negative cancer Catherine had. The oncologist could not say no to the Viking and soon we were in his office discussing protocol with him and his nurse practitioner. A course of 6 rounds of chemotherapy was prescribed. This would raise her chances of survival to 76% from 56% (which was what it was if she only had surgery). Significant numbers. "I'm going to do it," Catherine said that evening at the kitchen table. "Good for you," I said, though I feared this treatment so much, I considered it worse than death and would have been entertaining a hundred other options. "I guess I have to roll with the punches," said Catherine. "And I'll roll with you," I said taking her hand, "even if I have to row you across the river Styx," I added, tears welling up in my eyes and hers too. We smiled wanly at each other. It was as close to a pact of commitment as we had given each other in 17 years of being together. The irony of Catherine's diagnosis was not lost on us. We had both been deeply involved with the lives of a handful of rather famous women, afflicted with breast cancer, who were part of a study at Stanford in the '90s. A study that would prove that support groups extended the lives of women with metastatic breast cancer (or at least improved their quality of life). 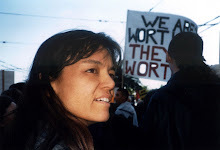 They had appeared on a Bill Moyers' special and been interviewed numerous times. At the time, Catherine had her own business as a videographer and her main gig was to record this study group. For, in order to prove something about support groups, there has to be documentation of every nuance, every emotion expressed by these women. She followed them for five years, witnessed their deepest issues around their illness, their mortality, their complaints about doctors' bedside manners, whether their husbands were supportive, how their friends reacted, how they faced death. For Catherine, doing this work was meaningful in the wake of the AIDS crisis, for she had lost many friends to the disease. And her best friend from high school was right then in the process of dying of AIDS. The job gave Catherine a seriousness and an acquaintance with death that was unusual for an American. It was part of what attracted me to her. A mutual friend at my office introduced us. I was in the process of being tossed to the wayside from a five year relationship with a woman who was leaving me for another and I was soon to be homeless. This story made me a tragic figure, in my own right, from which Catherine wanted to rescue me. About the time I moved in with her, she had to give up the unprofitable videography business and get a full time job in order to keep her house. Which meant she had to find someone else to take over the job of recording the women. And so she trained me. I needed work to tide me over while I started my business as an organizer. It was my turn, now, to follow the women until the study ended two and a half years later. I sat behind a two way mirror to record them with two cameras operated by remote control. I would focus one camera on the woman who was talking and the other on one that might respond, then switch between the two. The cameras could pan around three quarters of the room, move in for a tight head and shoulder shot or back out to take in the whole room. It wasn't Hollywood, but it was sophisticated enough to warrant some skill. Apart from what Catherine taught me, I also took a class at Foothill College in television production. Later when one of the women was too sick to leave home, the group wanted to meet at her bedside, and I was asked to come along and bring a camera on a tripod. Being in the same room as the women called for a new set of skills. While I was proud to be able to move with the ease of a dancer, I had to be unobtrusive in such a way as to call no attention to myself. I learned to disappear. All my concentration focused on listening so that I could anticipate who would speak next and capture that response too. The job trained me to give everything that was said equal value without judgement. At the same time the peer response of the women to each other would inform how I would later talk to my clients about their overwhelming lives. Both Catherine and I felt honored to be witnesses of the group. Every week, the women gave us little bits of truth about what mattered; that it wasn't about what you had accomplished; it was about knowing yourself. This was enough to sustain me on my quiet path of self-knowledge for outside those walls the high tech boom screamed loudly of money and riches. The women buffered me from that siren song of super wealth (or rather feeling inadequate that I wasn't going to achieve such wealth). I soon realized that my attitudes about death were also different from those around me. I was just not caught up in the tragedy of dying. And I couldn't figure out why. Why were therapists coming into the observation room and lamenting at how sad it was that these women were dying? After all they were strangers to them, not family members. Weren't they informed that the women had metastatic cancer before they took on the job? But it wasn't just those who worked there. Everyone in this country seemed horrified by the idea of death and avoided mentioning it. I began to look at my own heritage. Tried to explain it to a staff member at lunch. "It's just that, in Thailand, we don't take so much responsibility for dying," I attempted to explain. "You mean because life isn't valued there?" she said. I was so stunned by this stereotype that I turned to one of the therapists for help, but it was not forthcoming. I was stumped. I didn't have enough words to explain that death was accepted so readily, not because we didn't value life, but because we were constantly reminded of how suddenly death could come. It was in the language, in the acceptance of the unexpected, in the long, multi-layered, funeral proceedings. Later I would laugh when I read, in a comparison of cultural attitudes, that Americans thought death was optional. So that was it. It was tragic because they had failed to keep it from happening. At a dinner party once, the topic of meteors came up. Catherine thought that the thing to do was to use missiles to shoot down the meteor so as to prevent it killing us. This, I thought, seemed a rather extreme use of resources for such an unlikely occurrence. "What's wrong with death by meteor," I said thereby ending the conversation. I thought I was being serious, but the others were amused by what appeared to be my absurdist sense of humor. That I was not impressed by death became an asset once Catherine received her diagnosis. When others showed fear at the news, she felt obliged to reassure them, tell them it was going to be okay. She didn't have to do that with me. She could talk to me about the things that scared her, get my opinion on things. "You can be my friend," she said relieved. I went to her doctor's appointment with her so I could offer her my take on what was being said, look up her drugs on Wickipedia and otherwise calm her. On the first day of chemo, Catherine sat in her recliner at the infusion clinic, got very emotional and apologized for wrecking my life. "No you haven't," I protested, "you've made it that much more interesting." She was used to taking care of everyone—me, her brothers, her father. It became clear to me, now, how much effort she put into it. She had to get used to having others take care of her. But she didn't have to entertain me. A writer is always looking for new material. And the people-watching hadn't been this interesting since I was a child walking the streets of Bangkok; the lives of the disfigured beggars we saw along the way, teaching me how fortunate I was. Across from Catherine's recliner sat a young woman who was smiling at us from under her hat, her hair probably thinning. Her young life introduced so early to this trauma gave me pause. And she was so upbeat about it too. A young man accompanied her; they were watching something on her Powerbook. In the next chair over sat a man, who was already bald, watching the small TV that came with every chair. He had the off color pallor of one undergoing chemo. One of his legs was amputated and I watched the stump moving back and forth as the afternoon wore on. He was quite young too. How prevalent this disease had become. There was a whole building devoted to cancer patients now. And one just for women with cancer. Things had come a long way since our work with the study group. I felt that many of the women's complaints had been heard. Cancer had a whole new feel to it now. It was catered to, more in the manner of a resort hotel. They even had valet parking. The main building was filled with natural light, and a harpist moved from room to room trundling her harp on a dolly, then stopping to play for 15 minutes. Waiting times had been reduced considerably too. The infusion time itself took several hours, but where else could one sit with people who had nothing to do but rest. Though cancer had sliced through our life, blowing everything off our day planners, it had also made it something of a vacation. "All we have to do is endure," I told Catherine. Nobody would expect anything more than that. I was at my best when life stopped like this for I had no head for planning the future as Catherine did, making our lives work financially in the style to which we had become accustomed (which incidentally included terrific health care and disability payments for just this kind of illness). It was my strength to cope with the task at hand. I took out a book on origami that I had saved decades ago for just such an occasion though I would not have foreseen such circumstances. A few weeks prior, a client had unloaded a thick book of origami papers which I had not yet given away, so I was all set. 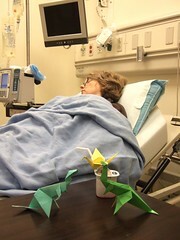 Folding paper animals turned out to be the perfect activity for hanging out in the infusion lab. It was non-threatening, sort of fun to watch, fun to do and addictive. (It was not until I learned to fold the traditional paper crane weeks later that I learned of the healing tradition of origami in Japan and was touched to read that children folded paper cranes when a classmate was seriously ill.) The infusion lab became my origami summer camp. In the second week of chemo, Catherine had a rough time of it. A low grade nausea dogged her increasingly each day and the drugs given her to manage it weren't working. I worried that she would lose strength altogether from not eating, but nothing appealed to her. I had to stop nagging her about it. I feared that I would suddenly flip from hero savior to sadist—Betty Davis in "Whatever Happened To Baby Jane". I had lingering regrets from my father's illness. He had been a difficult patient when he was ill and sometimes got himself sent back to the emergency room when he did not do as he was told. His wife put me up to the task of telling him what she needed him to do and I had handled it bluntly. The more frustrated I became, the more blunt I was, to the point of being unkind. My father was angry at me for ganging up on him. In the end he forgave me, but I was left wondering why I didn't think it through before following those requests. Things might have gone differently. "I don't have any solutions," I told Catherine feeling at a loss, "I wasn't trained for this". She was going through hell and I felt bad about not being able to help with either her physical discomfort or her emotional pain. I had already suggested she call the Stanford team, but a nurse who didn't know her case answered and had not helped. I asked her if she had called her therapist; he had assured her he was available by phone. (She did and he was helpful). I hid out in the garage organizing it, while she struggled to find her way through this. Her brother Steven, who still lived with us, came out of his room and sat with her to find out what was going on. He had been nearly the sole caretaker of their mother so I knew he had managed somehow and I could count on him as back-up. Maybe he had some ideas. I distracted myself by looking at pictures of tents. I was looking at tents when we were waiting for the biopsy results. Tents made me feel good. They reminded me of camping and the coziness of having everything I could possibly need right at hand. Lying in a tent was a memorably stress free experience and so made me happy. I shopped for tents and lulled myself to sleep going over their many features. I could have a tent for emergencies, one for traveling to jobs, one for showering in and for my composting toilet. What I boiled it down to was one I could just sit in outside in the garden; a safe space outside of time. I ordered one from a family business in Utah that made extremely sturdy tents from sage green canvas in the manner of those I knew as a child. It was their smallest one, a cabana, tall enough to walk into and just big enough to put a chair and a tiny table inside. It had no windows for it was designed to be used with a shower. When I pitched it, it was so splendid it made me happy just to see it from the kitchen window. With its square base it looked a little like an Aztec pyramid and had an air of mystery about it, all closed up like one; it seemed to contain the secrets of the universe should I wish to access them. Catherine pulled herself together for the second round of chemo and demanded from her team a better experience. They were concerned when they heard how it had gone and stepped up treatment to include hydration everyday and more anti-nausea drugs. This would help a lot. The doctor also confirmed that the tumor was measurably smaller; the treatment was working. It didn't sink in at first, but that evening a tiny bit of joy energized me and I realized how much I had forbidden myself to hope. The journey is still long, with three months of chemo to go, but it is the right journey and eventually we will emerge from it.